When thinking of Sacramento, California, high-test swamp music might not be the first thing that comes to mind, but this is where Slim Bawb cut his teeth with the Beer Dawgs, playing five nights a week for 20 years. Their take on swamp rock and blues was a powerful force, enough to gain them entry into the Sacramento Area Music Hall of Fame. But all things change over time, and Slim Bawb (also known as Bob Pearce) moved to Austin, Texas eight years ago, where he founded Swamp Studios and his latest band, Slim Bawb and the Fabulous Stumpgrinders. Slim Bawb has released six albums, the latest of which is Gristle and Guts. 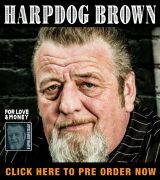 The new Fabulous Stumpgrinders line-up for this CD includes Jay Warren on drums and “Lil” Howard Yeargan on accordion, keyboards, and harmonica. Pearce takes care of the vocals, guitar, banjo, mandolin, mandola, and the boot bass. The latter is a custom foot-operated bass pedal assembly that Slim Bawb uses to bang out the low end. It might seem weird on paper but it works very well in the real world (and on this disc). One of the standout tracks is “Down to the River,” a gospel-tinged Cajun tune with some super sweet vocal harmonizing by Pearce and Yeargan. This is a fun song with good interplay between the squeezebox and the resonator guitar, with a kicking snare drum driving the way. Bawb also throws in a well-placed mandolin solo, which lends a little folk feel to the proceedings. This is backed up by “Bottle is Home,” a swamp blues track that provides a grim contrast to the hopeful feel set by the previous song. What album would be complete without a song about the misery of the hard-drinking life? But the Fabulous Stumpgrinders do not limit themselves to bayou music, as they serve up some hearty funk with “Last Call for this Fool,” which features hard-core syncopated electric guitar from Pearce and terrific harp work from Yeargan. They also put together a beautiful ballad, “Redneck Riviera” which may be the best track on the album with its gorgeous melody and laid-back vibe that paints a vivid mental picture. This band is not a one-trick pony by any stretch of the imagination. 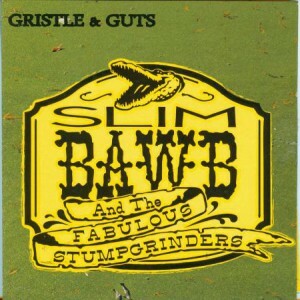 The title track, “Gristle and Guts” was written to honor Slim Bawb’s grandson Jon, who was hit by a drunk driver when he was 15. This swamp blues song tells the story of that night in chilling detail, accompanied for the first half by a somber guitar ostinato and a simple kick drum to hold the beat. After this, synthesizers are used to add to the mood and then all hell breaks loose to end the tune on a positive note. By all accounts it was a terrible accident, but fortunately Jon is recovering and getting stronger every day. Though the spooky accordion-fest “Bayou Shine” is listed as the final song on Gristle and Guts, there is a hidden reprise of “Job Job” for track 11, and it is a jangly 60-hertz snippet with glorious feedback and hiss. It is not exactly something people would buy all by itself, but it is a fun closer and gives and idea of what a neat spirit Slim Bawb has. 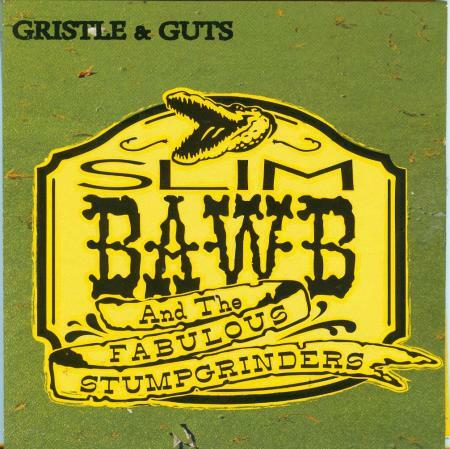 Throughout Gristle and Guts, Slim Bawb and the Fabulous Stumpgrinders keep coming up with new musical approaches for each song so that the album never gets dull and it remains consistently entertaining. 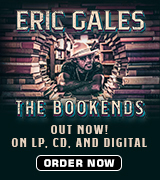 These guys have made their own niche of Louisiana-style rock and blues, and it works well for them. They are gigging regularly, and their shows are well-reviewed by critics and well-received by their fans, so check out their website for their schedule if you are anywhere near Austin. Also, if you are in the Sacramento Area, Slim Bawb comes back each year for a Beer Dawgs reunion show, so keep your ear to the ground or you might miss it!